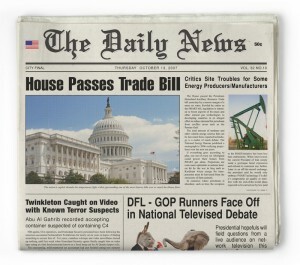 “Above the fold” is a term from the newspaper industry that refers to the content displayed on the top half of the newspaper after it is folded and placed on a shelf. This is prime real estate for the obvious reason that it is seen first by readers. The same principle applies to online content. Let’s look at the Folk Media site that you are visiting right now. 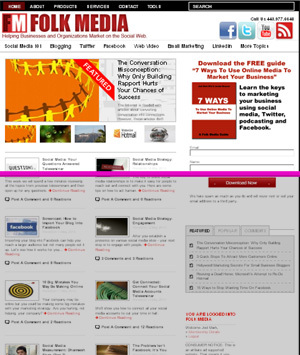 On our homepage we have content that is above the fold. Everything that is above the gray area is seen by visitors first. Borrowing from the newspaper industry we call this “above the fold.” You’ll notice that we’ve placed our featured articles here, links to all the categories and (the most critical) our email sign up box. Your visitors aren’t on your small business website to be entertained. They don’t want things cryptic and riddled. Visitors are online searching for a solution. Hopefully your business provides that solution. So make sure you make it EASY for them to access your products, services and content. Don’t make your customers think. Imagine they are 5th graders and spell things out for them in the simplest terms. “I’m not going to stoop to writing or designing my business website for a 5th grader!” I can hear you scream. The truth is – the best communicators on the planet speak in simple folksy styles that appeal to even the youngest observers. Put your best stuff at the top of your homepage. Make sure you place your email opt in form here too. Here are the items that I feel are critical to your “above the fold” real estate. If you are not a designer here is a good way to brainstorm possible ideas for your homepage. 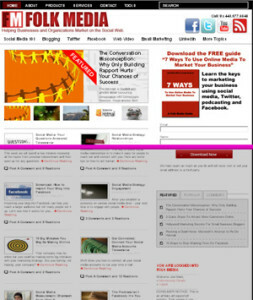 Print off 2 copies of your homepage. Take the first and lay it on your desk. Using a pair of scissors cut up all the elements of the second print off and play around with rearranging them on the first version. By doing this, you’ll see how space can be used and content can be organized. If you are using a WordPress blog, look through some of the “done for you” designs that Woo Themes has created. There are many that have good above the fold designs. Some don’t – so looking through these is a great way to train your mind to think above the fold.